TAMA Group - new partner of "Kammarton Bulgaria"
"Kammarton Bulgaria" works with a respect to the environment and its protection is a main mission. 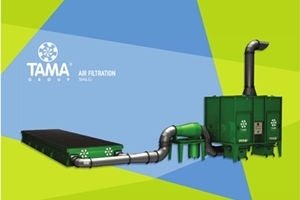 The new partner TAMA Group - Air Filtration is an expert in the area of the dust collection, fume extraction and air filtration systems. TAMA is the acronym of 'Tecnologie Avanzate Miglioramento Ambientale' (Advanced Technologies Environmental Improvement). The UNI EN ISO 14001:2004 environment management system, the UNI EN ISO 9001:2008 quality management system and the ATEX 94/9/CE Certification for TAMA products is a proof that quality is the primary goal. In the products range of TAMA are filtration units for sheet metal working plants, bag filter unit Pulco-Air, cartridge filter unit Kompac-Air, Nooil FV filter, Wet filter Idromix, Active carbon absorber, Cyclon separator, Silos and various components. They find important applications in many sectors: mineral, mechanical, wood, recycling, food, chemical, pharmaceutical and many others.